US Vice President Dan Quayle was a special guest at Tidbinbilla on 27 April 1989. 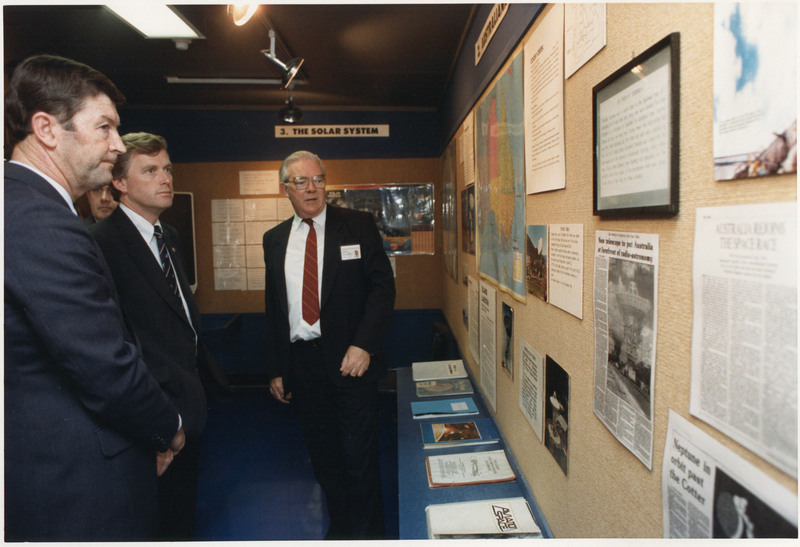 In this White House photo, he is being greeted by Station Director Mike Dinn. 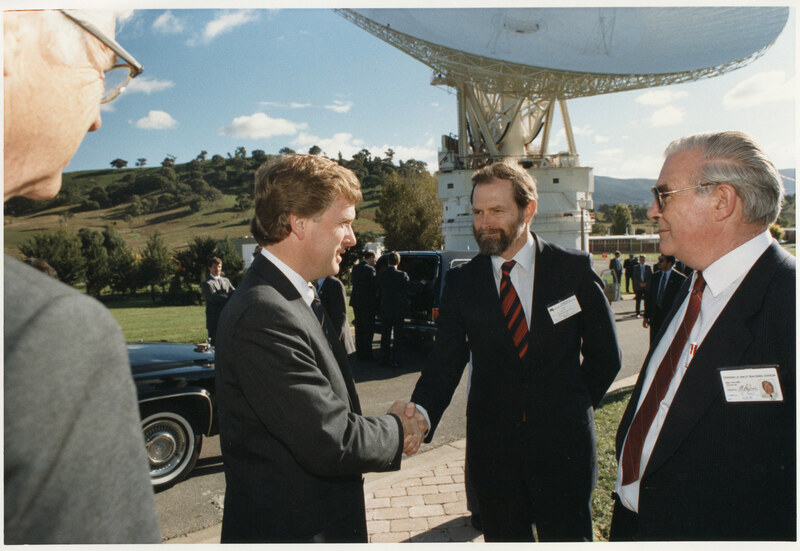 DSS-43 is in the background. 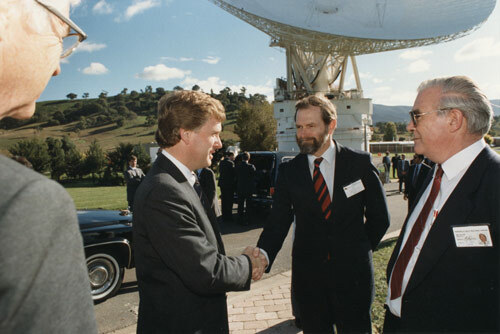 Bob Taylor NASA representative to Australia; Vice President Quayle; John Boyd, Branch Head of the Australian Space Office; Mike Dinn, Director of Tidbinbilla Deep Space Tracking Station; Bruce Middleton, Division Head, Aust Space Office. 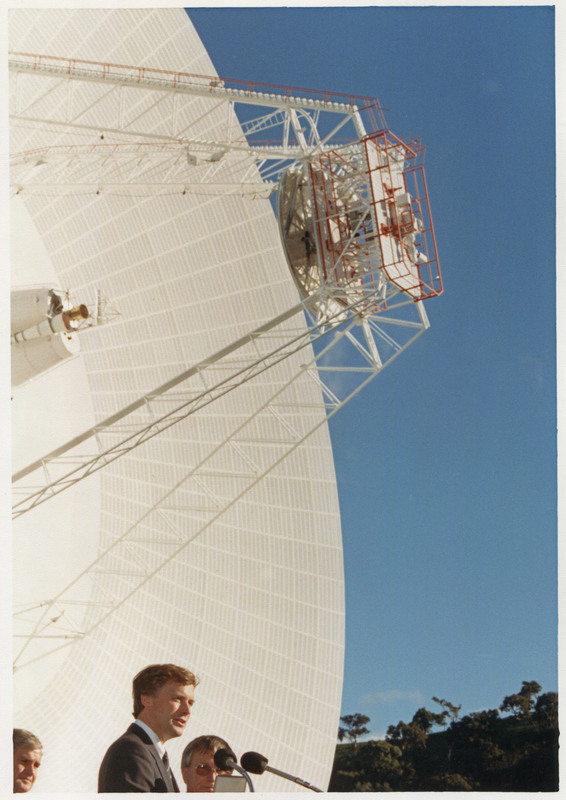 Photo courtesy Mike Dinn, scan by Colin Mackellar. 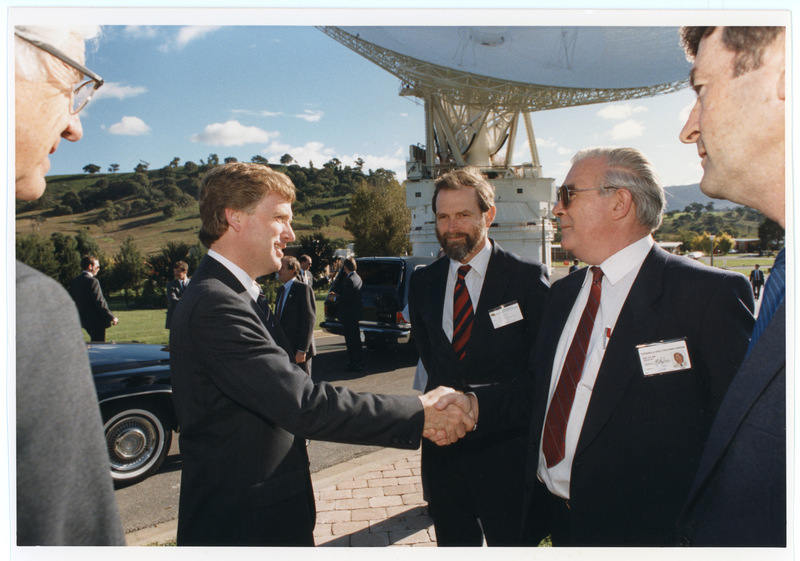 Here is the visit as recorded on videotape. 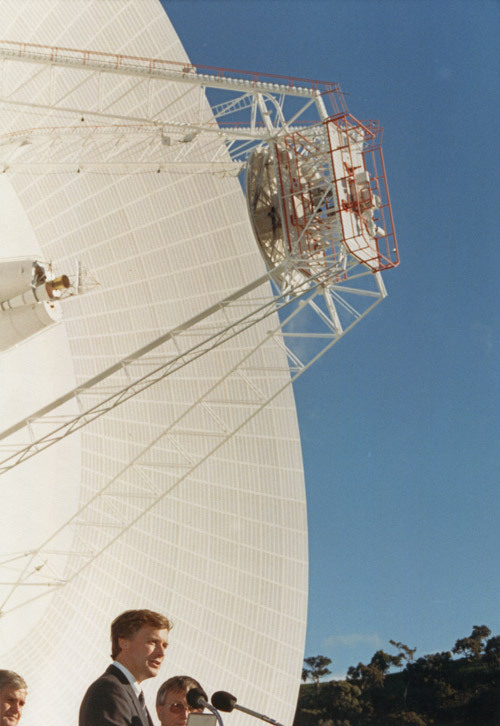 28 minutes duration. 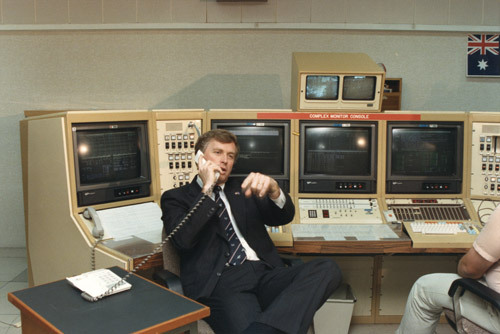 VHS video courtesy Mike Dinn, digitised by Colin Mackellar. 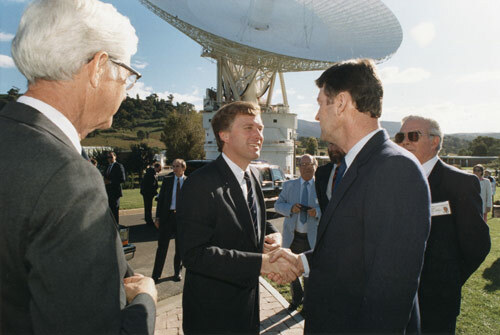 US Vice President Dan Quayle is greeted by Bob Taylor, NASA representative to Australia. 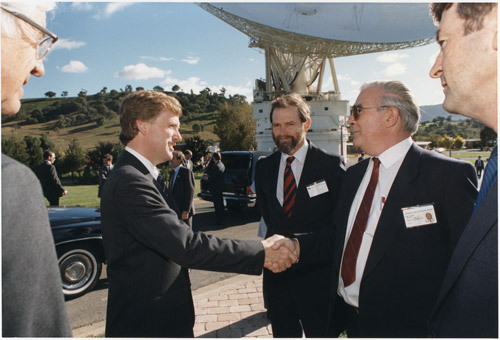 US Vice President Dan Quayle is introduced to Bruce Middleton, Division Head, Australian Space Office. 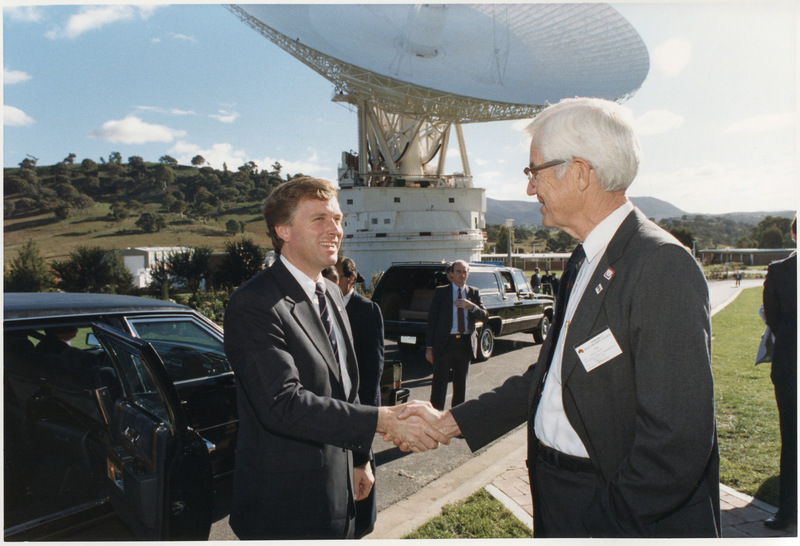 US Vice President Dan Quayle with John Boyd, Branch Head of the Australian Space Office. 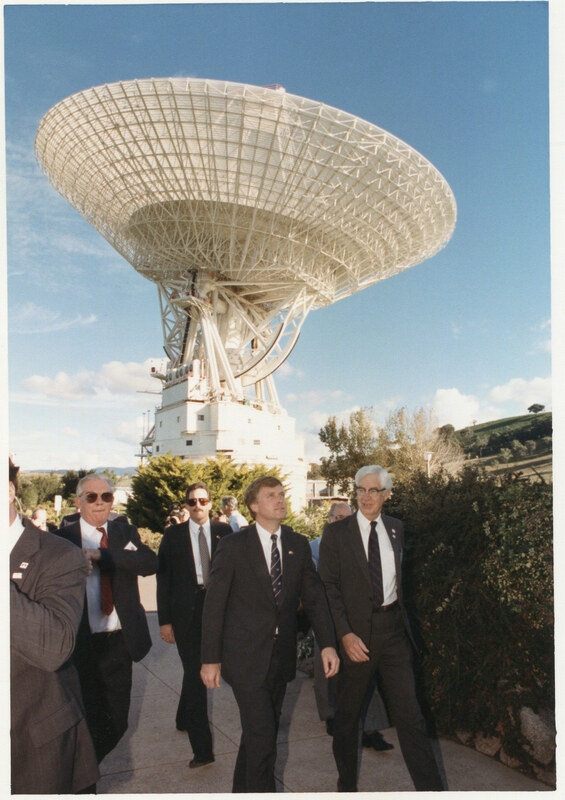 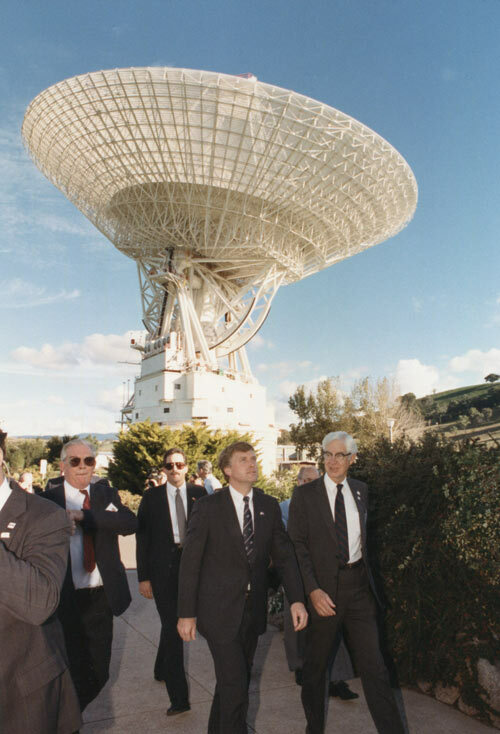 US Vice President Dan Quayle is accompanied by Bob Taylor, NASA representative to Australia. 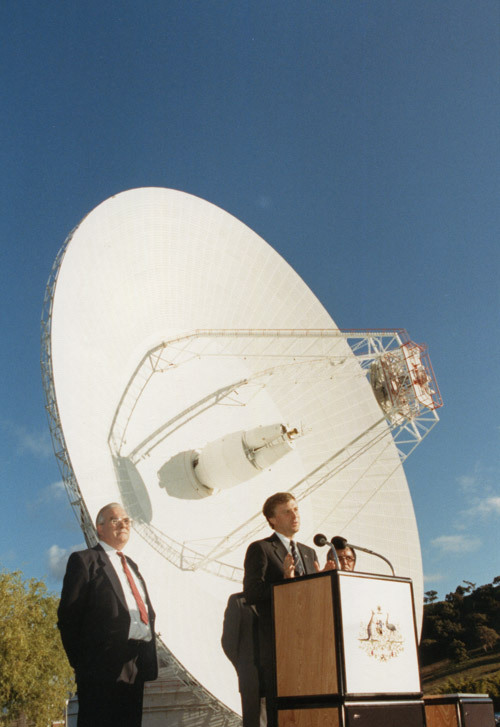 In the Visitors Centre, Station Director Mike Dinn outlines the long history of Australian space tracking support. 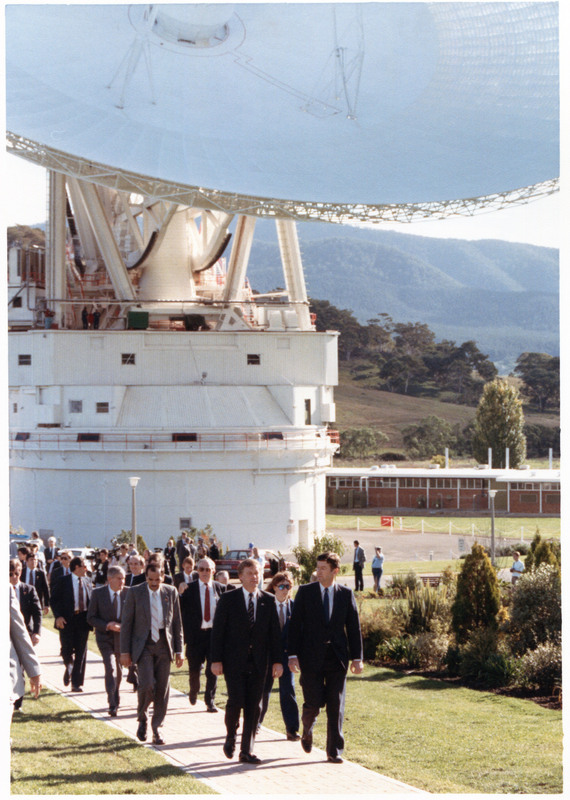 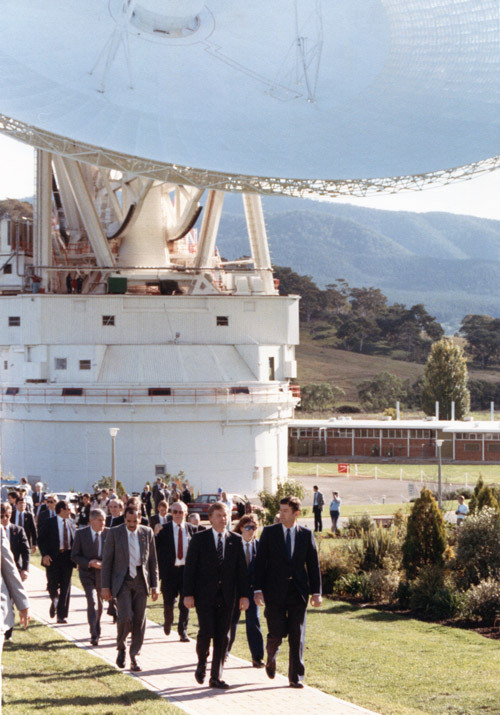 The Vice President and Bruce Middleton, after a tour of DSS43, walk to the Operations Building. In the Operations Room,via NASCOM, the Vice President speaks with crew members of the STS-30 Space Shuttle mission, scheduled for launch just a few days later. 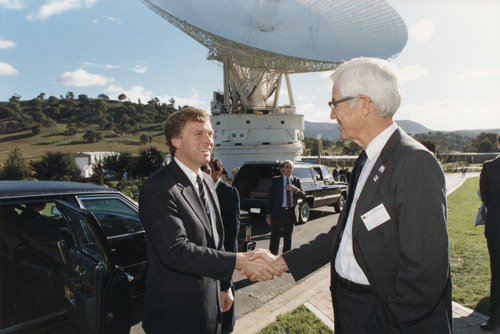 In front of the Operations Building, the Vice President presents the NASA Public Service Award to recently-retired Station Director Tom Reid, who is just visible above the lectern at right. Mike Dinn stands at left. 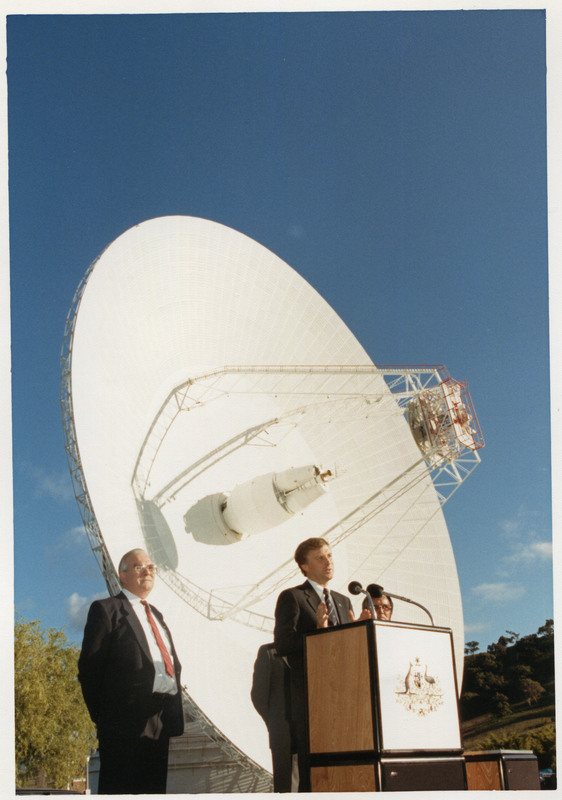 The Vice President presents the NASA Public Service Award to Tom Reid.